We can all agree that it is easier — and often times even more fun — to litter stuff about but to clean up afterwards, almost everyone dreads. This is why most of us tend to feel a sense of achievement and fulfillment whenever we get around to cleaning up our house. We then feel so good that we decide to reward ourselves with a bottle of our favorite drink. Sorry to bust your fulfillment bubble but you are forgetting one thing. Making your house clean is just a scratch on the surface. But keeping it clean? Now that is a war! I am not trying to lump everyone into the same category — the lazy bunch. I know that there are sometimes genuine reasons why we cannot get around to cleaning our living space, or cleaning as thoroughly as we want to. But the truth remains that no one is going to clean up your house for you. That’s why you and every other person need to have a guide to maintaining a clean home. Cleaning isn’t a one day thing. It’s an everyday thing. And there are specific ways to go about enacting the cleanliness mentality. 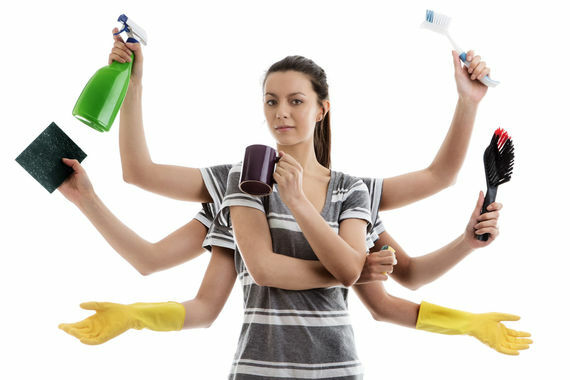 So, for every single mom, single dad, dual parent families and roomies, here are a few tips you can employ to keep the dirt and clutter demon away. If you do not live alone, that means you do not enjoy the benefits of living in that space all by yourself. Everyone who stays under the same roof with you — your wife/husband, kids, and roommate — should bear part of the burden of keeping the house clean. You should have a sit-down with your co-inhabitants and create a cleaning timetable and a responsibility chart. These should show how every one of you is supposed to help maintain the sparkle in the house. I know from experience that when you contribute to the success of a thing, you would not like to see it fall to the ground. Same applies when you all contribute to the sanity of your house; none of you will like to see it get cluttered again. Whenever someone — perhaps your kids — make a mess, DO NOT walks past it. If you do, chances are you might never find the time to get back to it. This goes for everything, no matter how damaging or irrelevant they may seem. If your children scatter their toys on the floor of their room, pick them up or get them to do so immediately. If someone walks into the house with wet feet, wipe the floor immediately. If you unwrap a piece of candy, put the wrapper in the trash immediately. Do not leave it on the table or floor or anywhere else. Developing the habit of cleaning a mess immediately helps you to prevent subsequent build-up of dirt and clutter. Plus dirt generally becomes harder to clean if it is not taken care of immediately. Whenever you go shopping, you will see an avalanche of packaged items that line long rows of shelves from one end of the room to another. Whenever you buy such items, you should keep in mind that the packaging could become a clutter hazard. When you take an item out of its package, you have to find some other use for it or thrash it, then take it out to the garbage. In general, the more items you buy, the more you will have to worry about potential clutter. Try as much as is reasonable to avoid packaged items. For example, you can visit a farmer’s market or sign up for a CSA (Community Supported Agriculture). In the latter, you can get a box of organic produce from a local farm at a low price. And you know the best part? It all comes in one massive box! So you have only one item of clutter to worry about. Also, it is easier to find another use for a big box than smaller items of packaging. I remember the first time I put my feet on the ground and waged a war on clutter. I had been living alone, seemingly oblivious of the clutter around me. After a full day of thorough cleaning and putting away of items that were lying all over the place, a stunning realization hit me. I had not seen the floor of my apartment in so long I had forgotten what it looked like. At that moment, I felt like giving the floor a hug. Actually, I am not sure how, but I did give the floor a hug. When your belongings are strewn about the house, it can make your space feel messier than it is, or even smaller than it is. To take care of this problem, sift through all the clutter to determine things that are still of use to you. Put these items in a pre-designated area in your house. Take the rest out to the garbage immediately. Sometimes you will find items that are still usable but are no more of use to you. Put all these items in a box to be given away. It will be of use to others who need it. At first glance this should sound rather off-topic, but it is not. I am sure we all know or have at least heard of that workaholic parent who has no time for his/her twin children. When children do not have the attention of their parents, they tend to act out — in school, at home or both. This is worse if your kids are below the age of 11. A friend of mine had this problem a few years back, so she quit her job and started her own business. This helped her be around her kids more often. She always picked them up from school and spent about an hour talking with them about their day. The result of this is that they began to look up to her and to learn from her, One of the fallouts of this is that they always tried to do what she did. Well, she loved cleaning — and they picked that up too. Another thing you should consider is to take your kids out from time to time, especially if they are having a bad day. Visit a recreational centre, go to the zoo, go get ice cream or anything else you can think of. This will help keep them in a good mood. You do not want him or her throwing tantrums at home, because they usually do not throw tantrums empty handed, if you catch my drift. By the time they are done, no item will be where it is supposed to be and you will be the one to clean it up.